Fort Wayne, Ind. -- One of the largest public infrastructure projects in the history of the community is underway with the construction of the Deep Rock Tunnel. The five-mile-long tunnel, more than 200-feet under the earth's surface, with an interior diameter of 16-feet, will have a significant impact on improving the quality of our rivers. Over the next several years more than 4,000 workers will be involved in aspects of tunnel construction. Arguably, the most important worker, grinding away 24-hours-a-day, will be the Tunnel Boring Machine (TBM). At 20-feet in diameter and 400-feet in length this massive machine is vital to the construction of the tunnel. It's tradition to give this important worker, the TBM, a name. Mining lore says that as far back as the 1500s workers payed to Saint Barbara for protection while working in the dark underground. Most TBM's are still given women's names, but that's changing and some have received male or gender neutral names. Over the past month we've worked with area schools, neighborhood leaders and City Utilities staff members to come up with ideas for a name. Students narrowed the list to four and now we're asking residents to vote. Buster or Bedrock Buster: The machine digs deep underground. While digging, the machine “busts” through bedrock. The machine is designed to break apart rocks and tear through them. Daisy or Daisy the Digger: During World War II, Fort Wayne's professional women's baseball team was named the Daisies. This name honors the ground-breaking and earth-shattering role of the Daisies, who helped pave the way for women's professional sports. MaMaJo: A tribute to Fort Wayne's three rivers, Ma from Mary, Ma from Maumee and Jo from St. Joe. Pronounced “Mama Jo.” The tunnel will help protect Fort Wayne's rivers. 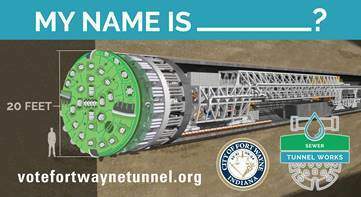 Wayne the Worm: This combines the name of our city and the purpose of the machine, which is to dig the tunnel in bedrock just like a large worm would dig a tunnel in the earth. The TBM name will be revealed next month.